Natural blackberry flavor perfectly captures the taste of freshly picked blackberry. No artificial sweeteners, the sweet flavor and aroma to create a perfect brew, pastries, bakes, drinks and more! Enjoy the exceptional taste and scent. This mouth-watering flavor extract is great for recipes for clear beverages, desserts, smoothies, frozen yogurts, desserts, jam sauces, and ice cream. 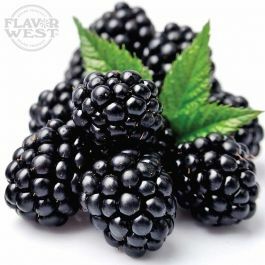 Type: Blackberry All Natural Water Soluble Flavoring. Ingredients: Natural Flavoring, Propylene Glycol. USP Kosher Grade Flavoring. Usage Rate: 15-20% for E-use. Flavor suitability: beverages, wine, smoothies, frozen yogurts, desserts, shaved ice, margaritas jam sauces, pastries, gelato and ice cream. Specific Gravity: .92 No Refunds on Flavoring. This is an excellent flavor. Although it is not a very strong flavoring, it is very good. Really need to use at 20% or more to get the flavor out of it but it is worth it.